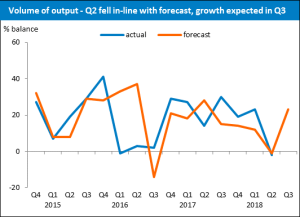 The UK printing industry almost exactly matched the downbeat expectations for Q2, as far as output and orders are concerned – fortunately the forecasts for Q3 suggests some growth ahead. The latest Printing Outlook survey shows 33% of printers increased output levels in the second quarter of 2018. A further 32% held output steady whilst 35% experienced a decline in output. The resulting balance (the difference between the ups and the downs) was -2; down on the +23 recoded in Q1 and just undercutting the Q2 forecast of -1. The Q2 period seems to have been characterised by fluctuating periods of activity and inactivity with significant dependence on the performance of clients’ markets. However, there also appears to have been a consistent reduction in commercial print run-lengths and an increase in ordering delays. Anecdotally, the packaging sector has exhibited more stability but client performance and levels of uncertainty remain a concern. A poor performance in Q2 has not restricted the forecast for Q3. Printers expect output growth to bounce back in Q3 with a strong performance. 41% of respondents predict that they will increase output levels in Q3, a further 41% expect output levels to hold steady. That leaves only 18% forecasting that output will fall in Q3. 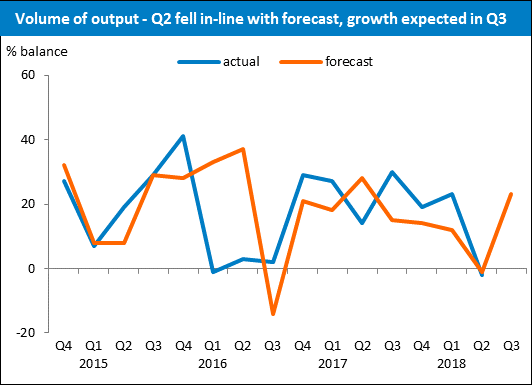 The forecasted balance of +23 would, if realised, be a significant upturn from Q2 and surpass the Q3 output growth balance in the last two years. The output balance of -2 was just below the forecast of -1 for Q2. A balance of +23 is forecast for the coming three months. Competitors’ pricing below cost continues to be the most voiced business concern, though only just – the proportion selecting it this quarter is down from last quarter; to 66% (it was 70%, 65%, 70% and 81% in the preceding quarters). Paper and board price concerns remains the second ranked concern; this was selected by 62% of respondents, down very slightly from 63% last quarter (and 60%, 47%, 42% and 32% in the quarters prior to that). Profit levels being insufficient to ensure investment has maintained its 21% from last quarter, yet jumped to the third concern. The remaining vote allocation splits across poor output prices, access to skilled labour, Brexit and late payment. 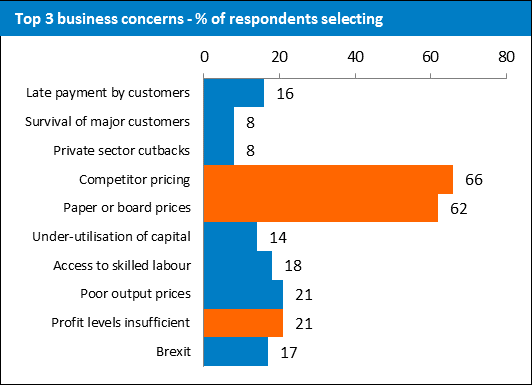 Stresses and tensions related to Brexit are ramping up in the UK printing industry – whilst diverse attitudes and outlooks do exist there is no escape from the topic, and no denial that confidence is on a downward swing. 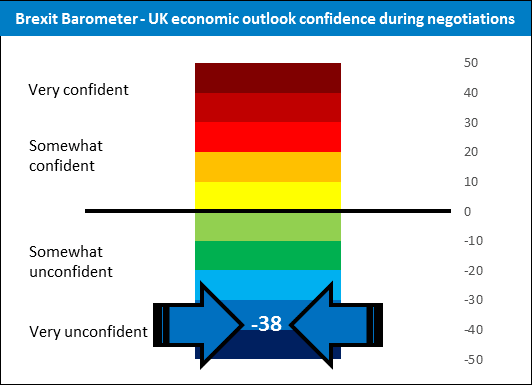 Both our Brexit Barometers continue to report negative confidence levels – regarding the outlook for the UK economy during the Brexit negotiation period, and following UK withdrawal from the EU. The barometer for during negotiations has turned in Q3, to increase in its negativity since Q2. In comparison to last quarter, fewer respondents (18%) are now ‘somewhat confident’ regarding the outlook for the UK economy; down from 26% in Q2. Just under one-third (31%) are currently ‘neither confident nor unconfident’, down from 35% previously. Over two-fifths (42%) are ‘somewhat unconfident’; down from 33% in Q2. Few respondents (1%) are in the ‘very confident’ category and 8% have now selected the ‘very unconfident’ category. Using these figures we have established a BPIF Brexit Barometer. Similar in construct to our usual balances approach we have produced a weighted balance where the ‘very’ and ‘somewhat’ confident returns offset the equivalent unconfident returns. The resulting balance is then scaled so that we can monitor confidence changes over time. The ‘unconfident’ returns continue to outweigh the ‘confident’ returns, and now by an increasing margin. 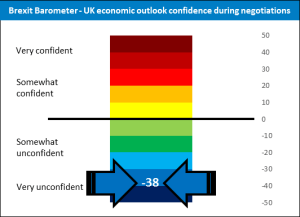 The actual weighted balance is -38 – which still places the current Brexit Barometer for the UK economic outlook during the Brexit negotiation period deep in the negative side of the scale; now around the middle of the ‘very unconfident’ zone. Almost back to the low achieved in Q4 2017 (-41). It is necessary to point out that the recent resignations from the Government’s Brexit team came right in the middle of the survey period; this will have affected confidence. The message we are picking-up is; if the Government is able to allay concerns from businesses, add to the detail on its negotiation position, make some progress with the EU and advise as to the potential outcomes and ramifications of these – then confidence will improve and our barometer will warm up. The BPIF Printing Outlook Q3 2018 report goes into further detail. The BPIF and CDi, in association with the Stationers Company, hosted over 90 leading lights from the print, creative and digital industries at the Oracle Bar, Leeds to celebrate Yorkshire Day 2018. Dale Wallis, Membership Director of the BPIF, opened the event thanking guests for their attendance to celebrate their respective industries this Yorkshire Day. David Allan, who was elected Master of the Stationers’ Company last month then spoke about the strength of these industries explaining how they are committed to educate for the future. The highlight of the event was the presentation of the Victor Watson Trophy by John Watson, OBE, whose late brother the trophy is named after. Now in its 3rd year, the trophy was launched in memory of Victor Watson CBE DL to recognise a Young Person of Outstanding Achievement employed in the industry. This year a Certificate of Merit was awarded to Ismail Mulla a business reporter at the Yorkshire Post. CDi President Robert McClements concluded the event by setting forth his plans to continue to promote and grow CDi in the future. He thanked partners, organisers and sponsors in particular The Stationers Company, Garbutt + Elliot and Ad:Venture, and went on to encourage attendees to browse the exhibitors Leeds City Region LEP, TechNation, CuratorSpace, TopicUK and Chloe Kutkus Morton, a freelance printmaker and illustrator supported by The Printing Charity through The Prince’s Trust, who were all on hand to demonstrate their own collaborative contributions to the sector. The day concluded with a BBQ lunch providing a great opportunity for all those who attended to network with peers, highlighting the important role the BPIF and CDi play as the ‘network of networks’.